MIAMI (AP) - A champion U.S. racer was the leadoff defense witness Monday in the Helio Castroneves tax evasion trial, testifying that a lawyer who is also charged in the case has a sterling reputation in the motorsports world. Jimmie Johnson, a three-time NASCAR Sprint Cup winner, said Michigan lawyer Alan Miller has many clients in NASCAR and the Indy Racing League, a circuit where the Brazilian-born Castroneves is a top driver. Both Castroneves and Johnson have received financial guidance from Miller. "Alan's reputation is about honesty. His character is second to none," Johnson testified in a 10-minute appearance. "He's given me great advice." Miller, 71, is charged with conspiracy and tax evasion for allegedly helping Castroneves, 33, and the driver's business manager-sister, 35-year-old Katiucia, avoid U.S. taxes on some $5.5 million from 1999 to 2004. All three face more than six years in prison if convicted. Prosecutors rested their case Monday after four weeks of testimony, much of it focused on Miller's role in handling financial arrangements when Castroneves was hired by Penske Racing in late 1999. Prosecutors say the deal illegally avoided U.S. taxes on $5 million of the Penske money, which first was earmarked for a Panamanian shell corporation and then wound up in a Dutch deferred compensation account. Johnson, 33, said Miller - a former professional football player and former National Football League Players Association lawyer - has represented him for about 12 years and came widely recommended by racing industry leaders. "I needed help to grow in my career. Alan was that guy for me," said Johnson, who won his 41st career NASCAR race Sunday at Martinsville, Virginia. The defense case for Castroneves, a two-time Indianapolis 500 winner, and his co-defendants is expected to take about a week. 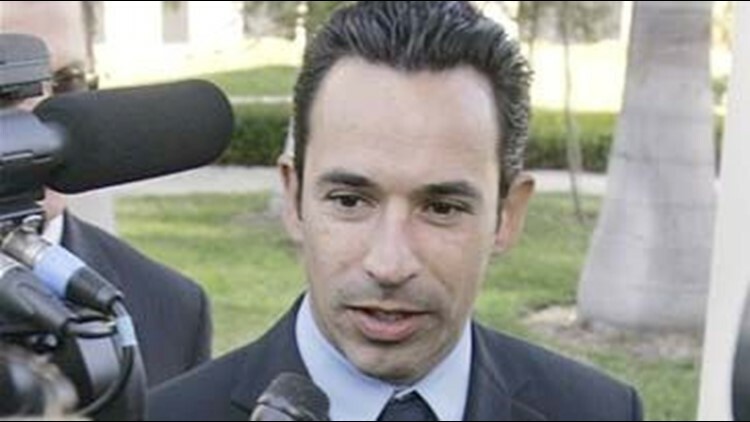 Howard Srebnick, attorney for Katiucia Castroneves, told jurors that evidence will show what the Internal Revenue Service tax agency claims were improper tax deductions were actually payments to their father for his years in Brazil working to promote Helio Castroneves. "There was an understanding, and a moral obligation on the part of Helio, to pay his father," Srebnick said. Castroneves also does not owe U.S. taxes on the $5 million sitting in the Dutch account because he has not yet received it, Srebnick said. Prosecutors claim the taxes were owed because Penske was ready and able to pay Castroneves, who cannot avoid tax just because he didn't accept the money. Either way, Srebnick said Castroneves relied on advice from experts like Miller and others for his financial dealings. "If the best-known lawyer in the racing community gives you that advice, you follow that advice. That's what Helio did," Srebnick said. Aside from his racing career, Castroneves is perhaps best known for his 2007 victory on TV's "Dancing With The Stars" competition. The tax case does not involve his appearance on that show.